Aston Martin DB5 From ‘James Bond: Goldfinger’ To Be Built Again — All The Crazy Gadgets Included! Posted on August 26, 2018 Author admin	Comments Off on Aston Martin DB5 From ‘James Bond: Goldfinger’ To Be Built Again — All The Crazy Gadgets Included! James Bond’s Aston Martin DB5 from the third installation of the iconic spy-thriller series – Goldfinger – is heading to production again. The grand tourer, driven by Sean Connery in the 1964 movie, is titled as the ‘The Most Famous Car In The World’ from the 20th century and has got a huge fan following all around the globe. Limited to just 25 units, the new batch of the original Aston Martin DB5 will be made by Aston Martin Works at Newport Pagnell; the car’s original maker. What’s more! The new cars will feature all the cool gadgets as in the movie. Of course, there won’t be any lethal weaponry like in the movie but most of the mock gadgets developed by Chris Corbould, the man behind Goldfinger’s special effects, will be included. In the movie, the car is portrayed to come with a radiotelephone, thermos with a built-in hand grenade, passenger seat ejection switch, protruding guns, revolving number plates and a lot more. The beautiful lines of the British grand tourer was showcased in other versions of James Bond, including Thunderball (1965), GoldenEye (1995), Tomorrow Never Dies (1997), Casino Royale (2006), Skyfall (2012) and Spectre (2015). 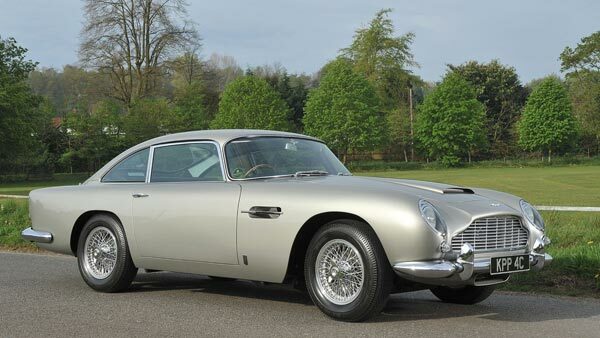 In fact, we had previously reported that the DB5 from GoldenEye was up for sale. The Aston Martin DB5 is one of the most notable creations in British automotive history. It is powered by a 4.0-litre straight-six engine which makes 282bhp and 380Nm of torque. The enginecomes mated to a five-speed ZF gearbox. The Aston Martin DB5 can sprint from zero to 100km/h in 7.1 seconds and tops at 230km/h; high figures for its time. Andy Palmer, Aston Martin CEO says, “The connection between Aston Martin and James Bond is something of which we are very proud and it is remarkable that the DB5 remains the definitive James Bond car after so many years.” “To own an Aston Martin has long been an aspiration for James Bond fans, but to own a Silver Birch DB5, complete with gadgets and built to the highest standards in the very same factory as the original James Bond cars? Well, that is surely the ultimate collectors’ fantasy. The skilled craftspeople at Aston Martin Works and the expert special effects team from the James Bond films are about to make this fantasy real for 25 very lucky customers”, he further added. For those who haven’t watched Goldfinger, here’s an awesome car chase from the movie. Regarding the price, the 25 exclusive Aston Martin products will cost 2.75 million GBP or roughly Rs 24.6 crore (without considering taxes). Deliveries should start in early-2020 and the owners will be treating them as garage queens forever. Because, these examples of the Aston Martin DB5 are not road-legal! Named after the British industrialist, David Brown, the Aston Martin DB5 is one priceless piece of automotive history and doesn’t retail for anything less than at least a million dollars in the used-car market. Even today, the car looks really beautiful and shares a glimpse of what we will be missing in most of the automobiles of today and tomorrow — art!